A permanent resident, but some birds undergo a short-distance migration south. The House Finch was a common species during the Minnesota Breeding Bird Atlas (MNBBA). Originally native to the southwestern United States and Mexico, the House Finch now has a breeding range that extends across much of the United States with the exception of the Great Plains, where populations are scattered. Small numbers also occur in southwestern and southeastern Canada. In the United States breeding densities are highest in California and Arizona (Figure 1). Permanent resident or short-distance migrant; the extent of seasonal movements is not well known. A ground and foliage gleaner that feeds almost entirely on plants, including seeds, buds, and fruit. Open-cup nest placed in a wide variety of vegetation and building structures; occasionally uses old nests of other birds. Breeding distribution and relative abundance of the House Finch in North America based on the federal Breeding Bird Survey, 2011–2015 (Sauer et al. 2017). Nearly 100 years passed before the House Finch was once again sighted in Minnesota as it rapidly expanded westward following its introduction in New York City in 1939. For many years in the early 20th century, there was a profitable trade in caged House Finches. Often an economic pest in California fruit orchards, they were trapped and sold locally. They were also shipped to pet dealers in the eastern United States, where they were advertised as “Hollywood Finches” or “Red-headed Linnets” (Elliott and Arbib 1953; Cant 1962). Cant, an ornithologist in New York, received a pair as a gift in 1933 that were purchased from a pet shop in New Jersey. Recognizing them as wild-caught birds, he turned them over to the New York Zoological Society but pondered if others in his position had released untold numbers of the birds. The first deliberate introduction of House Finches occurred a few years later, sometime around 1939, in Brooklyn. Unfortunately, due to the vigilant efforts of one private citizen who worked to bring an end to the illegal sale of songbirds, word spread among New York pet dealers that the finches they had were in possession illegally. Although the evidence is circumstantial, it seemed that one or more local dealers released the birds to avoid prosecution. At the time, no one thought these West Coast birds would survive the cold, northern winters (Elliott and Arbib 1953). The rest, as the saying goes, is history. Within 30 years, in 1971 and 1972, the first observations of House Finches were documented in Minnesota (Freedland 1971; Arneson and Arneson 1972). These records were not well documented and left open the possibility that the observers had seen Purple Finches. It was nearly 10 more years before the first well-documented reports were submitted. The first was in the fall of 1980 in Minneapolis, when a bird was observed on two dates in November and December at a backyard feeder. Described in detail, the record left no doubt that House Finches were indeed seen, making it the first official sighting of wild House Finches in the state (Bruggers and Bruggers 1981). Then, three years later, Breckenridge and his wife observed and photographed a male at their feeder in Minneapolis in December 1983 (Breckenridge 1984). This was the first fully documented (with photograph) record for the state. More records quickly followed from all corners of the state, including the first documented nesting in Rice County in the summer of 1989 (Janssen 1989). Janssen (1992) provides an excellent, comprehensive overview of the species’ rapid range expansion in Minnesota. By the spring of 1992, House Finches had been observed in 80 of Minnesota’s 87 counties. Counties lacking reports were all confined to the very northern regions of the state (Cook, Lake, Carlton, Itasca, Koochiching, Lake of the Woods, and Kittson). By 1998 nesting had been documented in 22 counties (Hertzel and Janssen 1998). Twenty-three years later, when the MNBBA was completed, observers reported 1,457 House Finches records from 18.2% (868/4,758) of the surveyed atlas blocks and from 23.3% (545/2,337) of the priority blocks. Breeding evidence was confirmed in 251 blocks (Figures 2 and 3; Table 1). The birds were observed in all but 3 (Cook, Koochiching, and Pennington) of Minnesota’s 87 counties, and breeding was documented in 60 counties; 2 counties, Redwood and Brown, were included because of 2 blocks along the Minnesota River valley that crossed county lines. The Twin Cities metropolitan region is the core of the species’ distribution in the state, and the largest concentration of records occurred in the Eastern Broadleaf Forest Province. Atlas data were used to develop a model to predict breeding densities of House Finches statewide (Figure 4). Although the model predicts that the species occurs at very low densities throughout all but the very northern counties of the state, moderate densities occur in local population centers, especially the Twin Cities, Rochester, St. Cloud, Mankato, and Moorhead. Many species have undergone dramatic changes since Roberts wrote his comprehensive account of Minnesota birds in 1932. Few, however, have so rapidly exploited suitable habitats across the state as the House Finch. From its first documented sighting in 1980 to the completion of the MNBBA 33 years later, the House Finch became a breeding resident in nearly all corners of the state! Based on work originally detailed by Hamilton (1992), Badyaev et al. (2012) provided a graphic illustration of the species’ rapid westward range expansion using data collected by National Audubon’s annual Christmas Bird Count. In 1961 the House Finch was still largely confined to eastern New York state, by 1981 it occupied much of New England and the Appalachian Mountain Region, and by 1990 it had reached the Great Plains. At the same time, House Finch populations in the western United States also expanded east across the Great Plains (Badyaev et al. 2012). Breeding distribution of the House Finch in Minnesota based on the Breeding Bird Atlas (2009 – 2013). Summary statistics of observations by breeding status category for the House Finch in Minnesota based on all blocks (each 5 km x 5 km) surveyed during the Breeding Bird Atlas (2009-2013). Summary statistics for the House Finch observations by breeding status category for all blocks and priority blocks (each 5 km x 5 km) surveyed during the Minnesota Breeding Bird Atlas (2009-2013). Predicted breeding distribution (pairs per 40 hectares) of the House Finch in Minnesota based on habitat, landscape context, and climate data gathered during the Minnesota Breeding Bird Atlas (2009-2013) using the General Linear Modeling method with an adjustment for detectability. In its native habitat in the southwestern United States and Mexico, the House Finch is a species associated with deserts, grasslands, shrublands, and other dry, open habitats. It also may be found in areas as diverse as riparian draws and subalpine bushes (Badyaev et al. 2012). Although it still occupies such areas in the western United States, more developed habitats, such as farmlands and urban settlements, are also utilized. In the East, however, the species is almost exclusively associated with urban areas, small towns, and farmsteads (Figure 5). Weedy areas that provide food, and trees or buildings that provide nesting sites appear to be the species’ primary and sole habitat requirements. Its plasticity in selection of nesting sites was noted as early as 1899, when Ernest Adams wrote, “Experience has taught me that the House Finches may nest anywhere” (Bent 1968). During the MNBBA, House Finches were strictly associated with development (Figure 6). In northern Minnesota, in the extensive forest landscapes of the Chippewa and Superior National Forests, House Finches have never been documented within either forest since monitoring began in 1995 (Bednar et al. 2016). Typical breeding habitat of the House Finch in Minnesota (© Lee A. Pfannmuller). Habitat profile for the House Finch based on habitats within 200 m of point counts where the species was present during the Minnesota Breeding Bird Atlas (2009-2013). Data collected by the federal Breeding Bird Survey (BBS) were used to develop models to generate a North American population estimate of 31 million birds (Rosenberg et al. 2016). In 2013, Minnesota was estimated to support only 0.6% of the continental population (Partners in Flight Science Committee 2013). Applying that percentage to the recent North American population estimate yields a statewide population of 177,000 birds. A statewide population number derived using MNBBA data estimated the population was nearly twice as large, with approximately 340,000 breeding adults (95% confidence interval of 220,000 – 1.5 million adults). Although the House Finch spread rapidly across Minnesota, the state is near the northern periphery of its range, and breeding densities are relatively low compared to regions farther west and east (Figure 1). Volunteers who conduct BBS routes each summer can expect to detect an average of less than 1 House Finch per route in Minnesota. This compares to an average of 58 birds per route in California, and 28 birds per route in the densely populated New England/mid-Atlantic Coast Region (Sauer et al. 2017). Since long-term population monitoring began in 1966, House Finches have demonstrated a stable population trend across the BBS survey region (Sauer et al 2017). Its recent presence in Minnesota and its low rate of detection along BBS routes result in a statistically unreliable trend estimate, but populations have certainly been increasing since the late 1990s. The population’s trend in the Eastern BBS survey region, which includes much of Minnesota’s Laurentian Mixed Forest and Eastern Broadleaf Forest Provinces, may best represent the species’ status in a large portion of the state. Throughout the region, BBS data demonstrate a significant long-term increase of 7.79% per year (Figure 7). However, since population numbers peaked in the mid-1990s, they have fluctuated and shown an overall significant decline of -0.74% per year from 2005-2015 (Sauer et al 2017). 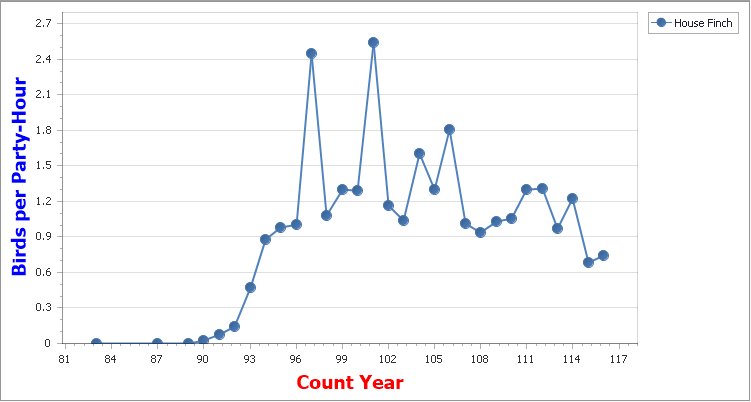 A very similar trend is observed in the National Audubon Society’s annual Christmas Bird Counts conducted in Minnesota from 1966-2015 (Figure 8; National Audubon Society 2016a). When species first arrive in a new area, if habitat is suitable and abundantly available, populations initially expand and grow in numbers at an exponential rate. Then, as densities increase, other mortality factors come into play to regulate numbers. For the House Finch, the most significant mortality factor has been the species’ susceptibility to mycoplasmal conjunctivitis, commonly referred to as House Finch eye disease, caused by the bacterium Mycoplasma gallisepticum, which is found in domestic poultry. The bacterium causes red, swollen, and watery eyes that can crust over and result in vision loss. Birds with serious infections are more vulnerable to predators and are more likely to die due to exposure and starvation (Cornell Lab of Ornithology 2016). Infected birds were first observed in Maryland in 1994 and in the Upper Midwest in 1997. 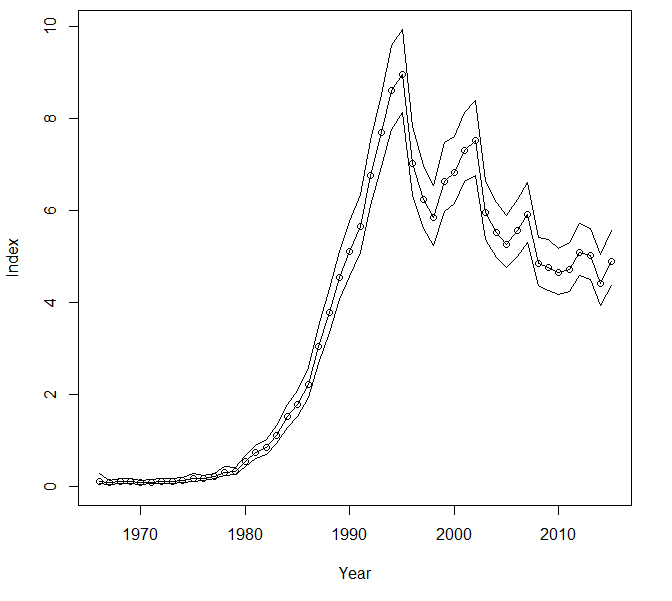 Breeding population trend for the House Finch in the BBS Eastern Region for 1966–2015 based on the federal Breeding Bird Survey (Sauer et al. 2017). House Finch numbers reported on the annual Christmas Bird Count in Minnesota from 1966-2015 (National Audubon Society 2016). Given its rapid expansion in distribution and numbers and its adaptability to human development, the House Finch is not a conservation priority. It has been assigned a low Continental Concern Score of 6/20 by Partners in Flight (Rosenberg et al. 2016). Recent analysis of the vulnerability of hundreds of North American birds to warming temperatures suggests, however, that House Finches may be vulnerable to the impacts of climate change. Models developed by biologists with the National Audubon Society predicted that the species could lose 69% of its current summer range by the year 2080, forcing the bird to find suitable habitat farther north, including throughout much of Canada (Langham et al. 2015; National Audubon Society 2016b). As a result of the analysis, National Audubon classified the species as “climate threatened”. Although the House Finch’s presence in the eastern United States was a result of a deliberate introduction of birds from the western United States, it might eventually have made its way eastward, albeit at a slower rate, without the aid of the pet trade. Unlike the European Starling and House Sparrow, the handsome male House Finch and his bubbly song have become welcomed additions to the chorus of songbirds in residential areas throughout the state. Arneson, Mary, and Ruth E. Arneson. 1972. “Possible House Finch in Minneapolis.” Loon 44: 53–54. Breckenridge, Walter John. 1984. “House Finch in Hennepin County.” Loon 56: 64. Bruggers, Denise, and David J. Bruggers. 1981. “House Finch in Minnesota.” Loon 53: 109. Cant, G. 1962. “The House Finch in New York State.” Kingbird 12: 68–72. Cantwell, George G. 1890. “A List of the Birds of Minnesota.” Ornithologist and Oölogist 15: 129–137. Elliot, John J., and Robert S. Arbib Jr. 1953. “Origin and Status of the House Finch in the Eastern United States.” Auk 70: 31–37. Freeland, David B. 1971. “House Finch Record for Minnesota.” Loon 43: 127. Hamilton, T. R. 1992. “House Finch Winter Range Expansion as Documented by Christmas Bird Counts, 1950–1990.” Indiana Audubon Quarterly 70: 147–153. Janssen, Robert B. 1989. “Minnesota’s First House Finch Nest.” Loon 61: 93. Janssen, Robert B. 1992. “The House Finch in Minnesota.” Loon 64: 79–81.